As much as I love Savannah Sparrows, I can’t say they are nature’s innovators. Of all the sparrows I know, Savannahs are the most predictable. They spend their time scurrying around on the grasslands, hunting for seeds. If a jogger or a birder startles them, they always flap to the nearest tree or bush and hide among the leaves, always at about head-high. Occasionally they’ll exert themselves a little more and get as high as 15 feet, but that’s about it. I never see them soaring sunwards, and I never see them skulking. It’s always the same: hop in the grass if unperturbed, fly to a low branch if scared. When the males feel the hormones surge enough, they get on a low-lying bramble or post and sing their dry, buzzy song. I have no idea how the females can tell which male is most appealing – the songs all sound exactly alike. No variations on a theme, like the White-crowned Sparrows produce. No original tunes like the Song Sparrows work on. Just the same tune, over and over, sung by everybody. I imagine if Savannah Sparrows had the vote, they’d pull the lever for a straight conservative ticket every time. So it was with open-mouthed wonder that I put my binoculars on a little form perched way on top of the light standard south of the Center for Urban Horticulture building yesterday. I expected to see a lofty Brown-headed Cowbird, surveying the possibilities of raiding someone else’s nest; or perhaps a Northern Flicker about to whang away on the metal to impress his girlfriend. But no. 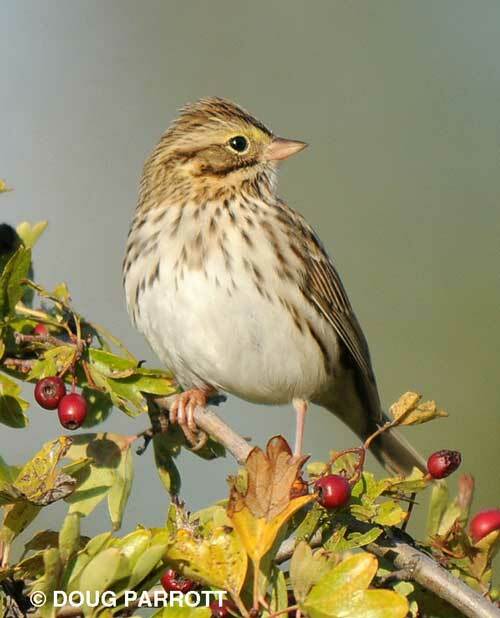 It was a Savannah Sparrow front and center, getting ready to sing a solo. He looked over his domain for a moment, threw back his head, opened his beak, and let fly with his song. BuzzbuzzbuzzBUUUZZZbuz. Okay, so his song was still the same ol’, same ol’. But I hope the female Savannahs were as thrilled as I was by his daring. He was giving his all for love, a Cyrano among Savannahs. This entry was posted in Uncategorized on April 26, 2010 by constancesidles.